October 3, 2016 — Left Unity — Jeremy Corbyn’s re-election to the leadership of the Labour Party on an increased vote is a significant victory for the left in the Labour Party and for progressive politics in Britain. It is a victory that everyone on the left celebrates. It demonstrates the strength of support that exists for changing the politics of the Labour Party: for shifting the balance of power within our society, away from the political and economic elites towards the majority, to empower and enfranchise the working class and communities hardest hit by the long run attacks upon the welfare state. It is absolutely clear that Corbyn seeks to bring significant change to the Labour Party: to restore its foundational commitment to the interests and advancement of the working class, to defend and extend its greatest achievement — the welfare state, and to make headway where previously there has been little progress — in making Labour a champion of international peace and justice, against British economic interventionism, war and nuclear weapons. All those who seek advance for this agenda wish to support Corbyn and his allies in bringing change to the Labour Party so it can implement some, or all, of these policies. Many on the left have opted to join the Labour Party in order to support this development. Others take the view that in addition to the struggle to restore the Labour Party to its original remit and ethos, it is also crucial for an alternative left politics to be expressed - anti-capitalist and anti-imperialist – as it has been in politics in Britain and globally, for a century or more. The purpose of this is not just to set out the extent of what is possible and necessary for a real transformation of society and human, economic and social relations, but to be able to pursue in practical terms the politics that this vision represents. This political space, to the left of social democracy, also needs to be occupied – in Britain, as it is across Europe and beyond. Left Unity is part of that radical left current, with parties and movements across Europe, acting in solidarity and recognising that the problems we face in Britain cannot be solved on a national basis. They are systemic problems that the working class internationally is organising against and we are part of that process. October 15, 2016 – Socialist Resistance – The Corbyn movement is the most significant development on the left in British politics that has occurred in the course of most of our political lives. It is certainly the radicalisation with the best possibility of a breakthrough in reshaping politics on the left and making a difference at the level of government. 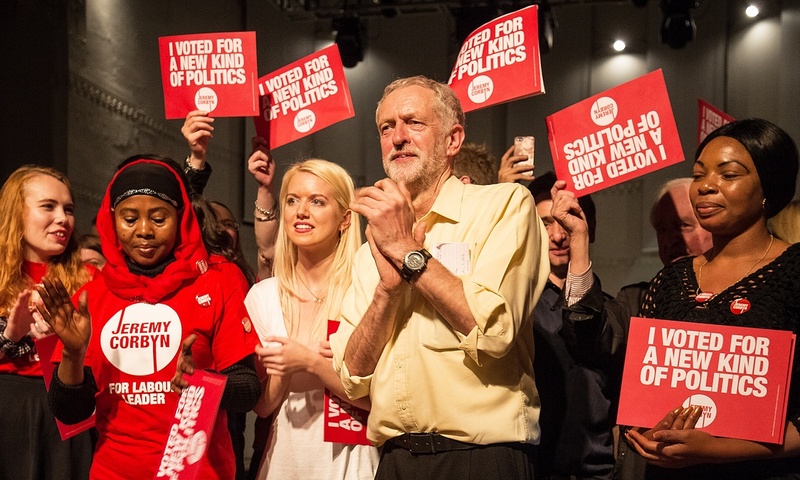 The Labour Party has half a million members and rising. That is more members than the Tories, LibDems, Greens and SNP put together. Many of these are young activists from recent radicalisation such as the Occupy movement, UK Uncut, the Greens and from the direct action environmental movement. It is entirely possible that the million members, which Corbyn has called for, will be achieved. Such growing membership enhances Labour’s chances of becoming the largest party in the British Parliament after the next general election and, hopefully, of forming a government through a progressive alliance with other parties. Momentum has around 20,000 members. Whilst it is lacking in internal democracy, is a genuine grassroots movement that has been turning towards mass campaigning. It is a step towards the kind of social movement which Corbyn and McDonnell have been advocating. The emergence of Corbynism has not been an easy process, of course. In fact, it has taken the form of a battleground with Blairism and other right-wing strands within the Labour Party that culminated in the coup attempt by the Parliamentary Labour Party in August. This conflict remains unresolved— the Labour Party contains two distinct parties in a single framework: only held together by the First Past the Post electoral system and the strength of the Labour brand. The fight to turn Labour outwards, and at the same time limit the damage by the right, will remain an ongoing struggle over the months ahead. But Corbyn has been significantly strengthened by two recent events. The first was Corbyn’s thumping victory in the second Labour Party leadership elections and the other was the way he and his team used the party conference itself, where he not only successfully defended the political line around which Corbynism originally emerged but strengthened it considerably. Of course there remain serious unresolved problems of team Corbyn’s attitude to Scottish independence, to the electoral system, and to electoral alliances. Corbyn not only strengthened his anti-austerity stance and his determination to democratise the party by handing power to the membership (which is transformative in itself). He also strongly defended immigration arguing that the task was to tackle the social problems caused by austerity and not blame migrants for them. This is a significant departure from the anti-immigration and bipartisan state racism that has characterised the Labour Party historically. He also went on to defend the free movement of people across Europe. There were other important outcomes from the conference as well, such as the promise to completely ban fracking (and strengthening the stance on climate change), ending the right to buy (hugely important) along with the capping of rents and giving local authorities the right to raise money and build council houses. The repeal of the anti-union laws is also crucially important along with the reinstatement of the collective bargaining structures – wages councils. He then placed the whole thing in an explicitly socialist framework – ‘socialism for the 21st century’. These measures go sharply against the neo-liberal consensus and the austerity-lite programme of previous Labour leaders. This would bring immediate benefits to the majority and give confidence to struggle for more radical measures. Socialist Resistance has reached two principal (and interrelated) conclusions in response to all this. The first is that Corbynism is now (overwhelmingly) the main focus of political radicalisation in England and Wales today. Left Unity has played an important role since its formation, and Socialist Resistance has been an enthusiastic supporter since its launch in 2013. But we have come to unavoidable conclusion that the space that Left Unity occupied to the left of Labour is not only rapidly closing down, but is being occupied by the Corbyn wing of the Labour Party itself. In fact, Corbyn made a very similar point in his speech to the Labour conference. In other countries, he said, radicalisation has taken the form of the creation of new parties of the left breaking from neoliberalism, while in Britain this same process is taking place through a traditional Labour Party. We have therefore taken the decision to move our political centre of gravity into the ‘Corbyn movement’ in order to fight more effectively for a Corbyn led anti-austerity government at the next election. We hope the whole of the left will be behind the struggle for such a government, which gives us the best opportunity to defeat neo-liberalism and austerity and opens the door to more radical change. This is not a break with the idea, which we have long defended, of building radical left parties to the left of social democracy across Europe; rather it is the continuation of such a policy by a different route. We will continue to work with Left Unity wherever we can, and some SR supporters will continue to be members of and be active within Left Unity. We think, however, that the movement behind Corbyn, McDonnell and Abbott is the most effective way to build a radical anti-austerity party at the present time.